A less than jolly post today. As some of you will know, The Lusitania, a Cunard ship first launched on 7 June 1906, was torpedoed off the coast of Ireland and sunk a hundred years ago today. One of my relations was on board with her infant son and neither body was ever recovered. It’s a very sad family story. Hugh Gilmour, a farmer, and Marion Mitchell Stewart married on 7 November 1883 at her family home, Carrot Farm, Eaglesham in Renfrewshire. Hugh was a good bit older than Marion when they married – he was 39 and she was 23. 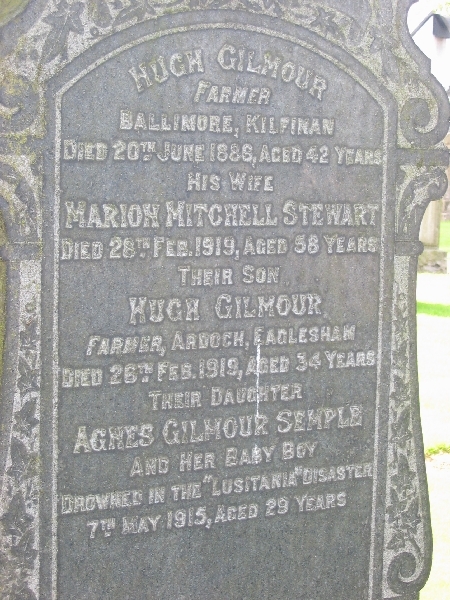 Marion moved to Hugh’s farm at Ballimore, Kilfinnan, Argyll and they went on to have two children. Agnes Watt Gilmour was born on 24 January 1886 and she had a big brother, Hugh, who was a couple of years older than her but their father died in 1886 at the relatively young age of 42 at Ballimore. Marion was left a widow at the age of 28, and with a 6 month old baby and small child to look after, she moved in with her unmarried brother, James Stewart, at Blairtummock Farm, Campsie in Stirlingshire. James was my great great grandfather’s brother. As time went on, Agnes met a young local joiner by the name of Andrew Semple. His parents farmed nearby at Enoch Farm, but Andrew went off to Canada in 1905. The Stewart family moved back to Carrot Farm, Eaglesham after the death of Marion and James’s brother, John, in January 1909. Andrew returned from Canada to marry Agnes where she was living at her brother Hugh’s farm, Ardoch, on 8 March 1911 and together they left for Canada. By the time of the 1911 Canadian Census at the beginning of June, they were living in Calgary and Andrew was working as a carpenter. Agnes returned home in 1914, perhaps so that she could be close to her mother, Marion, for the birth of her first child, which was the norm but it seems a long way to travel. Unfortunately, Agnes and her baby, John, were travelling back to Andrew and their new home in Canada from Scotland on the Lusitania when it was torpedoed on 7 May 1915. To make things even worse for this family, Agnes’s brother, Hugh, died on 26 February 1919 aged 34 in the vicious third wave of the huge influenza epidemic of 1918-1919 and their mother, Marion, followed suit two days later at the age of 58. You can find out more about the Lusitania, including details of crew and passengers, the story of what happened in the run up to the sinking and the associated controversies at the Lusitania Resource.